As a graduate student pressed for time, I don’t often get to read for pleasure, so Chitra Banerjee Divakaruni’s Before We Visit the Goddess, this veteran writer’s seventeenth book, was set aside for my summer break, to be read after required readings were finally cleared from my plate, and I could indulge myself properly. This family saga unfolds over nearly a hundred years, from the mid-twentieth century to 2020, and is told through a collage of viewpoint -- the three women’s -- but also from a few of the men who intersect their lives. 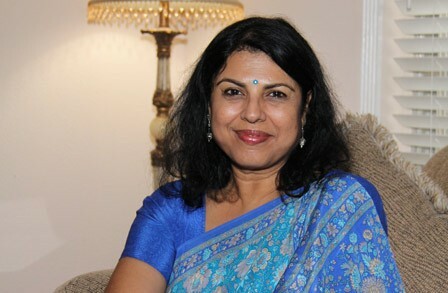 From letters to a medical history, Divakaruni uses a wide range of tools to construct the multifaceted story of this family. The greatest strength of the book is Divakaruni’s three unapologetically complicated, fierce female protagonists. Of the three, I’m most drawn to Tara, who, besides one other character, is the only one to narrate her story entirely in the first person. Because of that, I felt like I had the most access to her rage and pain and was with her as she fumbles her way to a functioning adulthood out of the wreckage of her youth. On the other hand, while I also found Sabitri and Bela compelling, the construction of their narratives puts their personalities at more of a remove. Sabitri gets only one chapter to herself, and then her story is told through Bela’s enduring mingled feelings of resentment and love and Sabitri’s shop-manager, Bipin Bihari’s, infatuation. Bela’s story, too, is frequently told through other characters’ voices, many of whom, especially Tara and Sanjay, her husband, can’t forget her failings as a daughter, wife and mother. While I think the unreliability is largely effective and adds to the complexity of the three women, there were key scenes in the novel that I wish I saw directly through their eyes and not through others’, especially as much of the book is told in the retrospective. In terms of the novel’s construction, I both like and dislike its compression and collage-like narration. At a sleek 208 pages, the book has enough narrative threads to justify a book twice as long, and for the most part, I admire Divakaruni’s restraint, especially since she tends to focus on key moments throughout these women’s lives and trusts the readers to fill in the gaps in-between. The novel’s relative lack of linear progression also allows these characters’s choices to reverberate in unexpected ways; by jumping from time period to time period and character to character, this allows us to see how their decisions snowball and shape character and destiny, their own and others’. Nevertheless, at the same time, the book habitually looks away from, summarizes or lets other characters explain certain important choices and scenes, which often felt frustratingly withholding. For instance, a key moment in Sanjay and Bela’s relationship that centers around a rental property they hinge their American dreams on is told largely after it happens. Since this incident leads to a breakdown of trust between them, I wanted to see it as it unfolded and was frustrated when I did not. Another series of decisions I wish I had seen was how Sabitri clawed her way from being thrown out of her benefactor’s house after an illicit romance to snagging a besotted mathematics professor who ends up catapulting Sabitri into a comfortable life. She tells us that this happens due to desperation and her own guile, but I wanted to see her pull this off, even though the book waves the summarizing away by explaining Sabitri’s story was meant to be bundled into a letter for a defiant Tara’s benefit. Because of the complexity of the novel’s construction, the way it plays with the faultiness and regret of memory, and the richness of the characters, I was slightly disappointed by the ending, which ultimately felt too tidy for me. Indeed, I wish that that a few threads throughout the novel, such as one secret that hounds Tara to its final pages, had not been resolved so neatly and finally. The symbolism of the secret is outrightly stated and robs it of any real metaphorical power and resonance because its meaning is so easily explained. Divakaruni’s handling of these characters is otherwise so sure, mature and clear-eyed that it was a disappointment when it felt like readers weren’t trusted enough to pick up on subtext. Having said all of that, I ultimately bought into the world of these characters, especially they way they use cooking to take control of their lives from forces that threaten to swallow them whole, from faithless men to poverty to sociopolitical upheaval to immigration to their own worst tendencies. Cooking, for Sabitri, Bela, and eventually, finally Tara, is also a way for these women to connect with one other and the people around them, and last of all, to remember what came before and to keep these memories alive. Even with all the times the book frustrated me with its coyness, these all too human women and their delicious foods, their curries, their pakoras and Sabitri’s triumphant signature dessert, Durga Mohan, named in memory of her mother’s sacrifice, never failed to draw me back in, to share in this book’s sumptuous meal. Anna Cabe is a MFA candidate in fiction at Indiana University and the web editor of the Indiana Review. Her work has appeared or is forthcoming in The Toast, matchbook, Gingerbread House, Reservoir, Racialicious, Cease, Cows and tiny poetry: macropoetics, among others. She was a 2015 Kore Press Short Fiction Award semifinalist and a finalist for the 2015 Boulevard Short Fiction Contest for Emerging Writers. You can find Anna on Twitter @annablabs.